This provided servo motor drive is 1000W to 2.6kW output power, single-axis control, 30A current rating, three phase 220V AC voltage, 2500 lines incremental encoder or 17/23 bit absolute encoder of feedback, is commonly paired with 1kW to 2.6kW ATO servo motor. 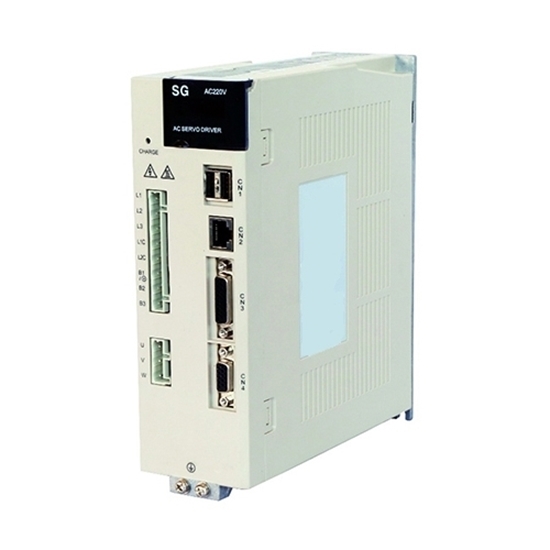 AC Servo Drive for 1kW-2.6kW Servo Motor is designed for applications that require frequent high speed and high precision positioning. The SERVOPACK will make the most of machine performance in the shortest time possible, thus contributing to improve productivity. Through various gate controllable transistors (IGBT, IGCT, etc. ), the DC power can be inverted to frequency-adjustable wave which is similar to the sinusoidal pulsating power by carrier frequency and PWM adjustment. Owing to the adjustable frequency, the speed of AC motor is tunable.